Blueberry almond blitz küchen. While I will sometimes embark on ambitious baking endeavors, I suspect I'll always prefer the quick fix that delivers a tasty treat. The cake, aptly named blitz küchen (which means "lightening cake" in German! ), comes together in a flash and, as you can tell, is as soft and fluffy as the blankets awaiting our little one. I chose blueberries as my fruit topping, partly because I love the way they taste and also because I enjoy the purplish color they bring to the cake once they've burst. While I liked the sliced almonds on top the first day, they got soggy pretty quickly and their purpose was lost. I would probably use pecans or walnuts next time, as they tend to hold up better. The combinations of fruit and nuts on top are endless, but you mustn't skip the brown sugar and butter bit--it adds a necessary sweetness and richness that really makes this küchen special. In the time it took to read this post, you could've nearly had this beauty ready to go into the oven--don't waste another second! Preheat the oven to 350 degrees F and spray an 8x8-inch pan with cooking spray. In a mixing bowl, beat together the butter and 3/4 cup granulated sugar for 3-4 minutes, until very creamy. Scrape down the sides of the bowl and add the eggs one at a time, beating briefly between additions. Whisk together the flour, baking powder, and salt, add to the butter and egg mixture alternating with the milk and ending with the flour. To make the topping, mix together 1/4 cup granulated sugar and cinnamon, then rub in the butter until you have the consistency of wet sand. 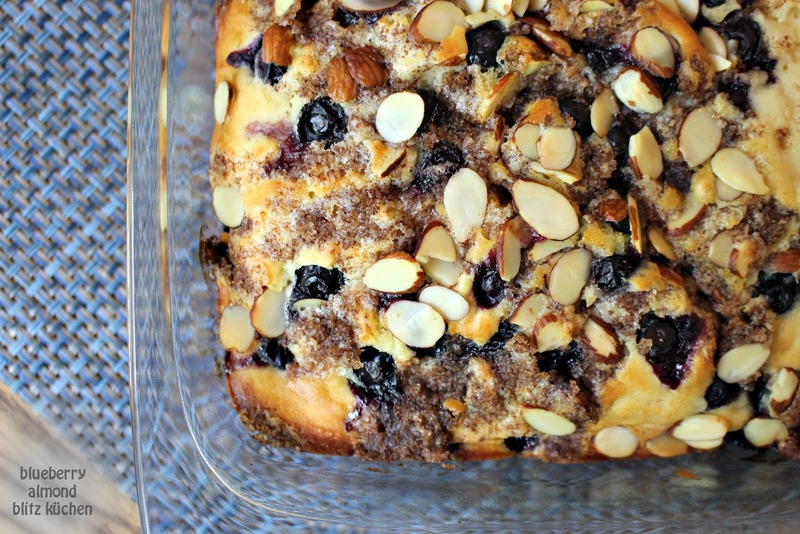 Top the cake with the blueberries, cinnamon sugar, and the almonds, in that order. Bake cake for 50-60 minutes, checking with a toothpick occasionally, and remove when the toothpick comes out clean. Look wonderful and delicious with all these blueberries and almonds!! Love yours caes Grace always look beautiful! We love Blitzkuchen, but I don't bake them often because they are usually loaded with butter and sugar. Now I am intrigued with yours as it requires just 1/4 cup butter and the result is just as great. This is a truly delightful treat, Grace! I will have to give it a try! You know, you are starting to change my perspective on cake. I never thought they could possibly be "not a big deal" from a work perspective. I just bought a package of disposable cake pans so I can eat a piece or two then give the rest away (thus keeping my "girlish" figure, the other issue)! Beautiful cake Grace, blueberries are my favorite and I love the way they burst open when baked. Next month we can go to the blueberry farm and pick our own, will make this then, thanks! Grace, you just taught me a new German word, thank you. I have never heard of Blitzkuchen but I know this kind of cake. It looks delicious. Can't wait to see your little one! We have been having baby parties galore here, with 3 of the little (grand)darlings now around! This is one loaded cake! Love every bite of it! The cinnamon and almonds have me intrigued. I normally pair lemon with blueberries. Can't wait to try this. Hope you are settling in nicely with your newest & sweetest addition. Isn't being a mom the best? I am super happy for you!!!! I wouldn't feel the list bit bad enjoying this for breakfast! I love how simple this is! Being just a few minutes away from cake is such a plus :). And all those flavors--just yum! This looks so good, love how the blueberry has all run down into the sponge. Delicious! Now, this is a cake to make again and again. It's a classic. And I could easily eat this every weekend for a delicious morning treat.